How Bacteria In The Gut Help Fight Off Viruses : Goats and Soda Rotavirus kills more than a half-million kids around the world each year. Now scientists have evidence that the secret to stopping it is hiding in the trillions of bacteria of our microbiome. You've got a trillion friends in low places: Bacteria in the gut may protect against viruses by signaling their presence to your immune system. If it was a snake, it would have bitten us. The secret to stopping a deadly stomach virus may be sitting right there in our guts, scientists reported Thursday in the journal Science. Or more specifically, the treatment is in our microbiome — the trillions of bacteria that inconspicuously hang out in the GI tracts. Immunologists at Georgia State University found that a tiny piece of gut bacteria can prevent and cure a rotavirus infection in mice. The study suggests a whole new benefit of the microbiome: to fight off viruses, says Lora Hooper, an immunologist at the University of Texas Southwestern Medical Center, who wasn't involved in the study. "It's tremendously important work," she says. Of course, humans aren't mice. So the findings need to be taken with a grain of salt — and tested in people. "But it's the first study, I'm aware of, showing that gut bacteria can trigger the immune system to protect against a virus," Hooper says. "And rotavirus is a bad one." Anyone who has had a bad bout of food poisoning has a good idea about how nasty rotavirus can be — projectile vomiting, painful cramping and watery diarrhea for up to a week. It's not fun. For young children in poor countries, rotavirus is one of the most deadly diseases. More than a half-million children under age 5 die from it each year. Immunologist Andrew Gewirtz, who led the study, hopes the bacteria protein from the gut will one day be used to treat rotavirus outbreaks in developing countries — although that's still quite a long way off. But he says the findings also change how we think about the immune system more broadly. "We were very, very surprised that a bacteria component offered powerful protection against a viral infection," Gewirtz says. "The basic thinking before was that bacteria have certain components on their surface that activate the immune system to fight bacteria, not viruses." His team has some evidence that the bacteria protein may protect against other viruses, such as influenza — "although it doesn't work as well on flu as [on] rotavirus," Gewirtz says. So what is this magic antiviral bullet? It's those hairlike threads that dangle off some bacteria and help them swim. Yup, that's right, the flagella. When Gewirtz and his team injected pieces of the flagella under the mice's skin, a part of the immune system kicked into action and stopped the rotavirus infection dead in its tracks. 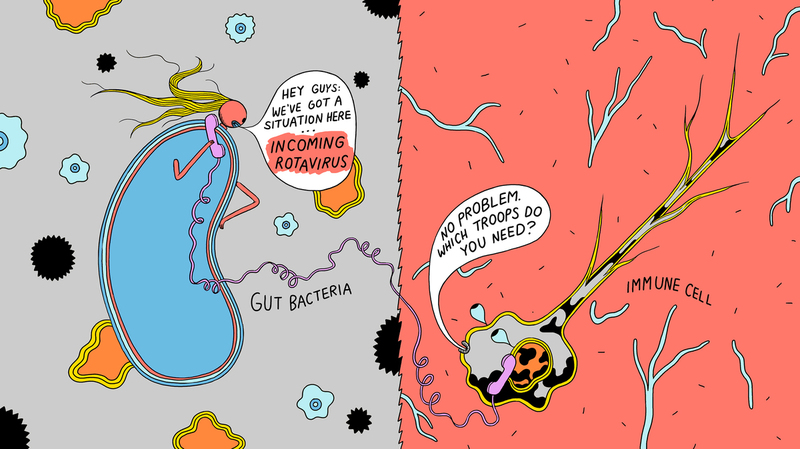 But these bacteria — and their flagella — are in our gut. Would they still be able to talk to the immune system? Hooper thinks so. Here's why. Just like our hair, flagella are constantly falling off the surfaces of bacteria as they swim around in the gut. "Cool immune cells, called dendritic cells, are constantly surveying what's going on in the body," Hooper says. They can bind to the pieces of flagella in the gut and then mobilize other immune cells to come and fight the viral infection. "If this holds true in people," Hooper says, "it would make me think twice about taking antibiotics. Not only are they going to screw around with your gut bacteria, but they may make you more susceptible to viruses."